"...Shaved 4 Minutes Off My Time..."
I shaved 4 minutes off my time. A new PR that I'm now working to beat again!!!" Would you like to improve your 10k performance? Would you like to run your best 10k yet? Would you like to get faster, improve your times and take the guesswork out of your training? If so, I know you'll find this page to be extremely helpful. Because I am going to tell you exactly how to run your best 10k and how to improve your running in even as little as eight weeks. Don't you feel that in this era of information overload there is just too much to learn and too much low-quality information? Long runs, tempo runs, intervals, easy runs, steady state runs, fartlek, etc. You have heard about them. You may be doing them. You may even be doing them correctly. But how do you distinguish between the right and the wrong information? How do you combine all the different types of running into one program that guarantees results? How do you make sure that what you are doing isn't counter-productive? Use the Wrong Running Program and All That Hard Work Could Be for Nothing! I have seen some terrible 10k running programs online. Programs that can easily get you injured. Programs that don't rely on quality workouts. Programs that are simply inferior and will never deliver the outcome you want. It's a real shame. You go out there multiple times per week. Battling conditions. Battling your full agenda. And in the end, it could all be for nothing. Because these programs get you injured. Or they simply do not deliver any results. It's such a shame. You really owe it to yourself to get the best 10k running program information so you can run not just any 10k, but your absolute best 10k! What You Need to Run Your Absolute Best 10k is "Run Your Best 10k"! What you really need to improve your 10k running times is a laser-targeted running program. And that is exactly what "Run Your Best 10k" delivers. It will provide you with the strategies you need to succeed in your next 10k race and it will provide you with the running programs that guarantee results. "...Thanks Again for Providing Such Good Support to the Running Community..."
"Congratulations on a job well done! I thoroughly enjoy the wealth of information I receive at your site. I appreciate that the articles can be applied no matter where you are at on the "running spectrum". Seasoned runners as well as someone who is brand-spanking-new can glean from the info found here. Your style is very informative, and yet so laid back - I feel like we're just chatting together on a run! Thanks again for providing such good support for the running community! 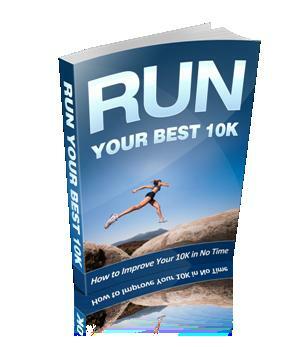 Get all you need to know about running your best 10k in one complete manual. Easily choose the right running program for you based on your needs and timeframes. No matter what your level is, you can adapt these running programs to fit your needs. Just follow the workouts in the program to get the results you need. No online cookie-cutter programs that are made for mediocrity. Use a program that works. "Run Your Best 10k" comes with a 365-day guarantee. That's right. If you don't run a personal best with the running programs in this book or if you are not satisfied in any other way, then you get a refund. Just to make sure you are not missing it: that's a 365 day guarantee. A 365 day not happy, money back guarantee. A 365 day no personal best time, money back guarantee. A 365 day whatever your reason, money back guarantee. Why? Well, I have complete faith in "Run Your Best 10k". I am convinced you will improve your times with the programs in this book. And I know what it is like to buy information online. What will you get? Will it be good or not? How can you know for sure? With this guarantee I am taking away all your risk. Order it. Try it out. 365 days long. Not happy, money back. That's as simple as I can make it for you! * 1 beginner running program (p.20) which gets you ready for your first 10k. * 3 advanced running programs for preparing for your 10k in 8, 12 or 18 weeks. These programs are easily adjustable based on your personal starting point. * Eighteen FAQ about the 10k running programs and about 10k running answered (p.6-14). * A 365-day guarantee that if you are not satisfied or are not running a 10k personal best, you get a refund. No questions asked. * 10k running article explaining race strategy and essential elements of 10k running training (p.15). * Eighteen 10k Questions and Answers from other runners included (p.28 - 65). * Three more useful articles which provide you with additional running tips and tricks (p.66 - 76). "...My life's changed due to this..."
"I started with your 30 minutes running program in July. By end of October I had started running 30 minutes non-stop. My average used to be around 3.5 kms in 30 minutes. Nowadays I run 4.5 kms in 30 minutes. I've lost a lot of weight and gained on fitness. I think your running program is a great help for people who want to start running. There are lots of training programs out there, this one gets lost in the crowd even though it genuinely helps people to get up and running (literally). My life's changed due to this, I am more high on confidence and more focused now. A great big thanks to you!" 1) Lifetime updates to "Run Your Best 10k"
Special password-protected area for best-running-tips.com members. Ask questions and receive additional guidance NOT available to regular visitors of best-running-tips.com. Members-only articles about different aspects of running. Early access and extra discounts for some of my other products. The membership access alone represents a $27,- annual value. You can start improving your 10k personal best time by ordering "Run Your Best 10k" today. The cost of this remarkable package, which includes Best Running Tips membership access is only $17,- for the moment. I think you'll agree this is a tremendous bargain. However, you do need to act now. I may increase that price soon. I am actually thinking of pulling this product off the market, upgrading it and selling it for way more than just $17,-. But you know, even though the price is extremely reasonable, here's what's really important. If this was just another lightweight cookie-cutter running program that leaves you injured, frustrated, or both, it wouldn't matter what the price is. It wouldn't be worth it. But with "Run Your Best 10k" you can be guaranteed that every workout you do is super-specific and programmed in the right order to help you towards your goal of running your best 10k. So, stop relying on the cookie-cutter running programs that simply do not deliver results. Stop wasting those hours and hours of training and get "Run Your Best 10k" TODAY! Ordering could not be easier. Simply CLICK HERE TO ORDER or press the order button below. Your order will be fullfilled on the spot. "...Keep Up the Great Work..."
"I am new to running, just started six weeks ago. I had a problem with my knee caused by golf, not running, so I was unable to run for 2 weeks. So really, I have only been running for 4 weeks. Anyway I have been using your stretching exercises for my last two runs and to my amazement I was pain free the day after my run for the first time. [....] Anyway thanks again for the advice and keep up the great work it is very inspiring." I believe in this product wholeheartedly. That's why I am providing you with this crazy 365-day guarantee. In fact, my friends said I was crazy by providing such a long guarantee. "Nobody does that", they said. Well, I do! 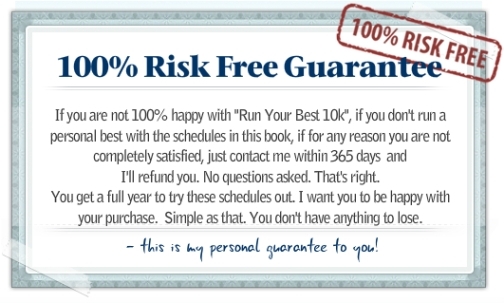 Get "Run Your Best 10k" today and you will have my iron-clad, easy 100% risk free 365-day guarantee that you will be satisfied. You don't have anything to lose. So, now that I've confirmed there is absolutely no risk to you, the next move is up to you. You and I already know that if you've read this far, you have a strong interest in running your fastest 10k yet. All that's left is to take the action to do it. If you want a laser-targeted running program... if you want the strategies you need to succeed in your next 10k race.... if you want a running program that guarantees results, you owe it to yourself to take advantage of this risk-free offer. Simply CLICK HERE TO ORDER or press the order button below. Your order will be fullfilled on the spot. P.S. If you want to start running faster 10k races, you owe it to yourself to give "Run Your Best 10k" a chance. Backed by a 365-day "not happy, money back" guarantee, you don't have anything to lose. This 100% risk-free offer provides you with the RIGHT running workouts at the RIGHT time to get you the results you need. CLICK HERE TO ORDER TODAY or press the order button below. "Run Your Best 10k" is only two minutes away from you.